This year more than 1.6 million Americans will learn they have cancer. The American Cancer Society projects that almost 590,000 people will die from the disease. The statistics are astounding, yet very personal to Terrence and Torry Holt, whose mom passed away after a 10-year battle with cancer. Terrence was six and Torry was 10 when their mom was originally diagnosed with lymphoma. Just think about growing up uncertain about your mom’s health and future. It’s almost unimaginable. At the Holt Brothers Foundation (founded by Terrence and Torry in honor of their mom), we’re trying to do our part to make life easier for children who have a parent with cancer. We recently hosted our second annual Playoff Party to raise money to support our mission and build awareness. And while the party was an absolute blast, we didn’t let people forget why we were there. It was all about the kids that we support and nuture. What was astounding to me at the Playoff Party was the number of people in attendance impacted by cancer. We lost count of the number of people who shared their personal stories with us – the cancer survivors, two young men who lost a parent to cancer, the young woman who lost her mom to breast cancer, the grandfather whose daughter has cancer, someone’s aunt, cousin, sister, brother, friend. While the stories are painful, they’re also part of who we are, what we do, and why we do it. And it’s also why so many companies and individuals support our passion and work. At the January 2015 Playoff Party, we raised $150,000 to benefit the children and families we serve through the KidsCan! program at four hospitals and Camp Kesem, a sleep away camp for kids who have a parent with cancer. We’d like to recognize the event’s major sponsors – Clean Design, Atlantic Tire & Service, Balfour Beatty Construction, Clancy & Theys Construction, Danis Construction, GMA Supply, Moe’s Southwest Grill, Skanska USA Building and SunTrust Bank – and thank all of our sponsors for their support and generosity. All sponsors are listed here. The statistics speak for themselves. There’s a need and it’s big. Thanks for helping us play a small part. We couldn’t do it without you. As executive director, I’m honored to be part of the cause. Pictured above is the Cunningham family, who participated in our KidsCan! program at Rex. 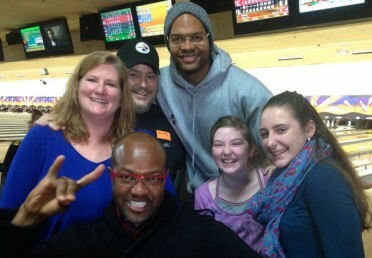 We enjoyed meeting them at the KidsCan Bowling Party in December 2014. Dad is winning the battle and his girls couldn’t be happier.